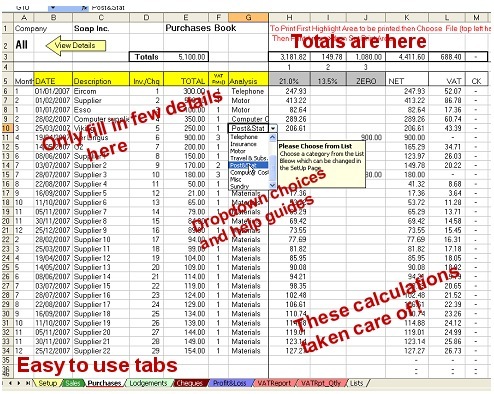 We have developed a book keeping spreadsheet cash book template. This is for use with Microsoft Excel and compatible spreadsheets. Our experience has led us to believe that the majority of small to medium sized businesses require a simple to use bookkeeping system, where no accounting experience is required. Some of the small business accounting software available is very expensive and difficult to use. The accounting software often includes a great deal of options that the user will never use. We have developed an ideal Excel Bookkeeping Spreadsheet system for the complete finance novice. It has been specifically developed by us to cover the needs of most Sole Traders so it is an ideal solution. 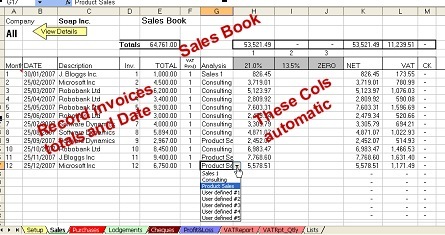 Our Excel Bookkeeping Spreadsheets offer a simple solution: -. Yes , I am ready to take control of my own bookkeeping.There is nothing similar around. That’s why we developed it! All headings can be fully customised to the users needs. Suitable for sole traders, partnerships and limited companies. Whole package can be emailed or uploaded to your accountant. Why pay €700- €800 on software that you won’t use 90% of the functions. 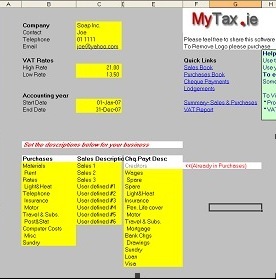 This and more is available free to clients of Harbour Business Service Ltd / MyTax.ie. Preformatted shaded areas to complete. Information is displayed in a simple, consistent format. For the beginner/novice user cells contain pre formatted formulas. For the more advanced user the spreadsheet is fully customisable. Easy for the user and their accountant to understand – as a result this may result in reduced accountancy fees! Keeps track of payments and receipts. These only need to be entered once. A summary sheet gives you a vital breakdown and an immediate picture of your finances. Similar to a profit and loss account. Prepares periodic completion of VAT returns. Drop down menus make inputting information easy. Suitable for sole traders, partnerships and limited companies, whether you are VAT registered or not! Now comes with automatic quarterly VAT Report. 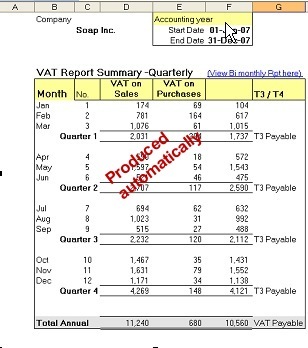 Fully automatic year end VAT reports including fully breakdown for your Return of Trading Details Form.